The 32 are now 2. 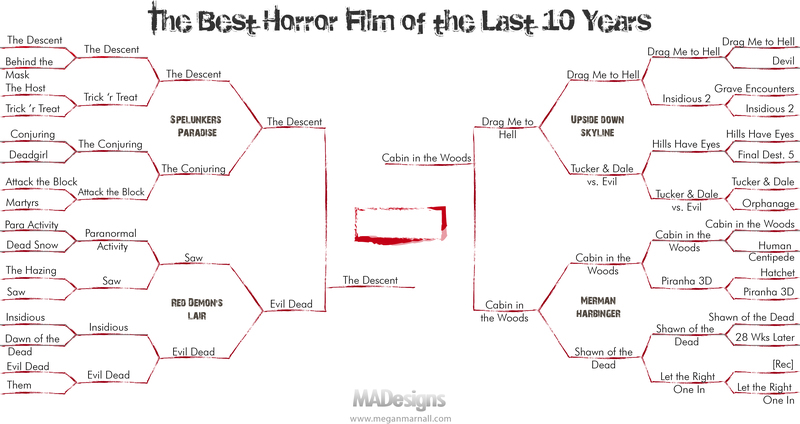 Cabin in the Woods and The Descent will be waging full on subterranean warfare on each other! These two films are arguably the most highly rated and appreciated horror films of the last ten years. They are completely different yet told with precision, care and intelligence. Sidenote: I think this is the first time that Joss Whedon is not the underdog. 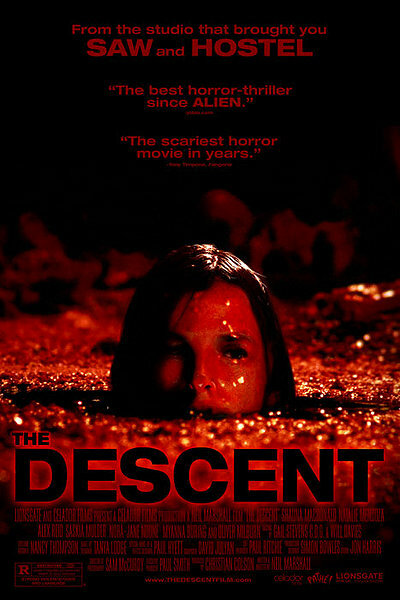 Let me Start with The Descent. The tiny budgeted Scottish film was directed by Neil Marshall. He was coming off his cult hit Dog Soldiers and wanted to prove there wouldn’t be a sophomore slump. The Descent didn’t disappoint and a cult classic was born. Since then Marshall has delivered blue-collar violence (Doomsday, Centurion and The Blackwater episode of Game of Thrones) with aplomb. He is an intelligent maestro of mayhem who represents low-budget film making at its best. Finally, a scary movie with teeth, not just blood and entrails — a savage and gripping piece of work that jangles your nerves without leaving your brain hanging. And so, for a change, you emerge feeling energized and exhilarated rather than enervated, or merely queasy. This is the fresh, exciting summer movie I’ve been wanting for months. Or for years, it seems. This is not a perfect movie; it’s so ragged, it’s practically constructed of loose ends. But it’s exciting because it ventures so far off the map. One imagines the filmmakers chortling with glee as they devise first one bizarre development and then another in a free-for-all for their imaginations. They establish rules only to violate them. It is intricately devised and the best horror deconstruction film since Scream. It plays with conventions and is told with a glee rarely seen in cinema. Most importantly, Joss Whedon and Drew Goddard have captured the nerd/fanboy zeitgeist in ways thought unimaginable. 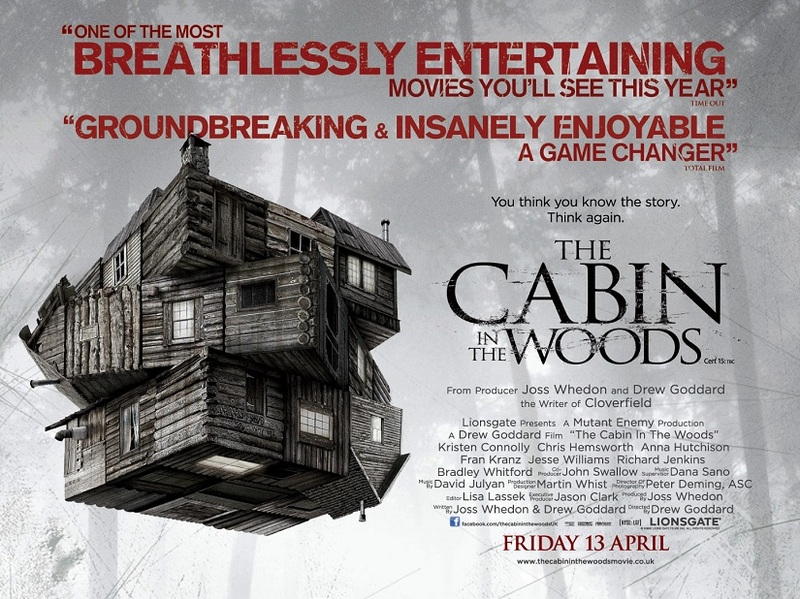 In other words, everybody loves Cabin In the Woods! Sidenote: This film sat on the shelves for two years due to the bankruptcy of MGM. Oof. Will the underdog win? Vote. Comment. Share. Watch them immediately!